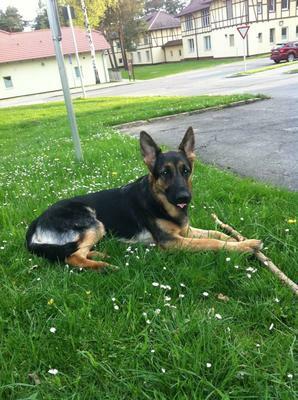 Marley is a 19 month old pure bred German Shepherd. She was born Christmas Eve 2010 outside of Nuremberg, Germany. 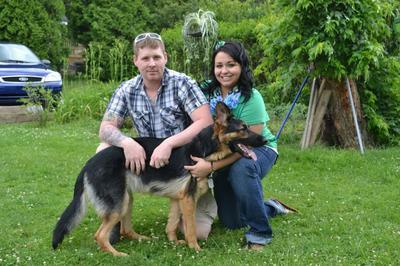 She was adopted April 2011, at 13 weeks old, by a military family. Her beginning was fairly ordinary, especially for a puppy. Destructing, chewing, nipping, barking back, and nothing could come between her and her favorite toy, her ball. As Marley was approaching 15 months, she began acting strange. Not being herself, laying around, crying. My husband and I were dumbfounded. What could possibly be wrong with our puppy? Having no children of our own, Marley was our baby. Our lifestyle, travels, weekend plans, everything included Marley. At this time in her life, Marley began visiting the vet a few times a week. She just seemed to be getting worse and the medication seemed non existent. All the vets could do was check her blood and chemistry panel every visit, give her a check up, and change her antibiotic. I can't even tell you how many medication changes we've had to go through. Her symptoms and blood work were clear that there was an infection. Her white blood cells were dangerously high, and she wasn't producing red blood cells on her own. She became very anemic. Her symptoms included loss of appetite, very high fever, panting, lethargy, weakness. The vets continued to treat her for infection, hoping to find an antibiotic that she would respond to. For a few weeks she would lay around and sleep, clearly extremely ill. When a new symptom emerged, I encouraged that my husband take her to the vet immediately. Her chest was rattling and making a frightening sound every time she took a breath. Upon arrival to the vet clinic, they had told my husband that she needed to be hospitalized and quickly, that she was much sicker than she was days before when they saw her. Marley was then rushed to the Tierärztliche Klinik, about an hour away in Nuremberg. They really couldn't tell us much just yet, but made us leave her. She was given an IV and blanket to lay on. The tests were yet to come. We called every single day to check on her, and see if anything changed. Every other day we would take the trip down to see her, only for about 30 minutes each visit, since she was so sick. They tested for everything. Distemper, parvo, fungus, auto immune, ticks, everything. She had blood cultures, a brain and spinal fluid tap, x-rays, ultrasounds, you name it, we wanted everything tested for. Auto immune fit best because she just wasn't getting better, they even suggested that we contact the breeder to see if any other puppies were having medical problems. The breeder had changed their phone number. Eventually auto immune was ruled out, as was every other possible sickness everyone thought. She was still not responding to medications and was losing weight drastically. As regularly a 70-75 pound dog, Marley had dropped down to 20 kg, about 40 pounds. You could see every bone in her body. The infection had spread to her joints and her legs were huge and swollen. After about a week in the hospital, they started to bring up euthanization. This suggestion just crushed us. In the back of our mind we didn't want Marley to be sick anymore, of course. 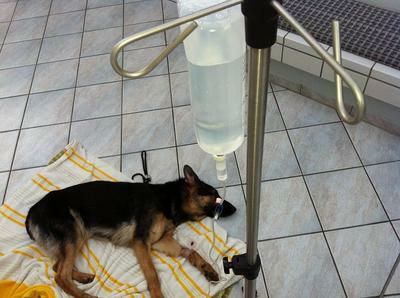 We knew the doctors were serious because Germans are very against putting dogs to sleep. I asked if she was in pain. They said no, just very sick. There were still a couple things that they could test for, and we decided to run those tests and put off euthanization, at the time money was no object and being that she wasn't in pain, we opted against it. We had tapped into our savings account and spend thousands and thousands on tests that all came back negative. Marley was a strange case to them, her main symptom was her dangerously high fever. They were talking about doing a blood transfusion, but would only make her better for a very short time. The doctors told us that if she lived that she might get better, but would just get sick again and have her life extremely cut short. She had become so thin, that my husband and I asked if we were allowed to bring her food from home. This is when things started to look up. Marley was so anemic and they said that they wouldn't give her any type of iron supplements because she was already on a ton of medication. So, we turned to Google. Anything we could find at the grocery store organic and high in iron, we'd bring her in the hospital. She mostly ate steak, white rice, garbanzo beans, scrambled eggs, and plain yogurt. Every visit we'd bring her meals to hold her over til we'd come the next time. Marley became being more responsive, and was gaining weight. Her white and red blood cells started to get better. After two weeks in the hospital, and still no diagnosis, they let us take her home. After we paid our 1800 EURO hospital bill. Days after Marley got out of the hospital, we were forced to PCS and move back to the states. We had put it off, and literally refused to get on the plane without Marley. Thankfully, she had finally been cleared to fly. After arriving in the states in the beginning of June, Marley seemed just fine. No fever, nothing, happy as can be. Her blood work had come back saying that her infection was gone and she'd live a normal life. Within the past month, Marley had begun to go down hill again. High fevers, infections, high white blood cell count. We had finally found a medication that she was responding to and it was helping, but she still hasn't been feeling well. We now take her up to K-State University, to their internal medicine vet clinic. They have had some leads that weren't even brought up in Germany. They discovered that she has a heart murmur. This could be a birth defect, but we wouldn't know because the breeder changed their number. They have tests to run that weren't ran in Germany, who said that they had tested for everything. We have revolved our life around Marley's illness and getting her better. She is cooked 3 meals a day, has her temperature taken every few hours, and loves playing in the house outside and with her ball. She gets spurts of energy multiple times a day, but still doesn't feel well. She is extremely sweet, helpful and affectionate. Please help if you can, we refuse to give up on her. With thousands and thousands in medical bills, its much harder to get her the care she needs to survive. Please visit this link to read more or even make a donation. thank you very much to everyone. Thank you so much for taking the time to read her story. She is our whole life and means the world to us! Your girl Marly is a Beautiful Shepherd. I pray she can beat this illness. I know she gives much joy. Hopefully, now that you are back in the states you can get the help that she needs. God Bless Marly and you both for taking such Great care of her. There Take care and God Bless. this dog has such an amount of will to keep pushing and hang in there for her owners.